Looking to create free PayPal account ? It is really easy and free. 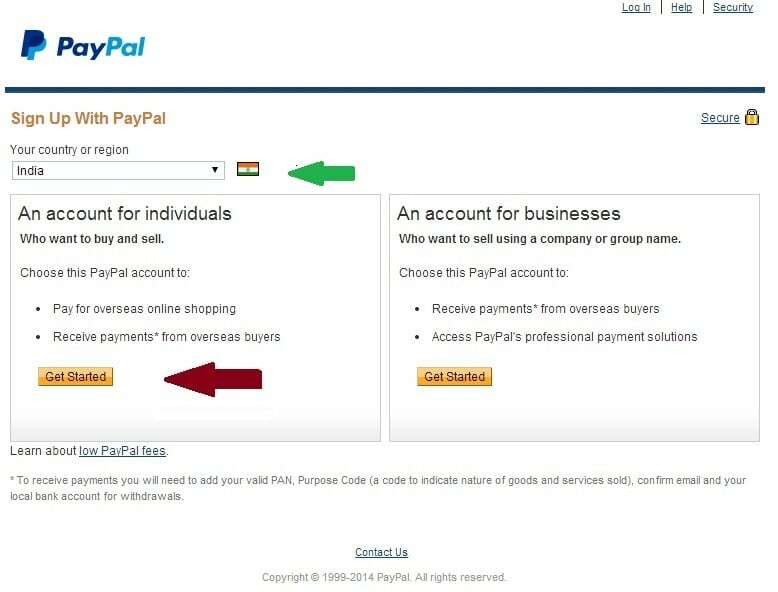 Here is step by step guide with screenshots for helping you to create free PayPal account. 1. First of all, you have to go PayPal sign up page in order to create free PayPal account. So just click here and open the link in a new tab and click on GET STARTED or SIGN UP button. Here is what it looks like on my screen. 2. Now select your country or region name from drop-down menu as shown near arrow below. (a) An account for individual – It let’s you pay for overseas online shopping and receive payments from overseas buyers. (b) An account for businesses – It let’s you sell using a company name or group name.It is a professional account which is commonly used by overseas sellers. So the choice is yours. Which ever account you wish to create just click over the Get Started button below that but don’t get in too hurry. Please read their terms and conditions carefully before signing up. 4. Hope you have already read their terms and conditions.Now the real work starts. You have to fill in your details and information now. this stage may prevent the verification of your PayPal account. So fill your details very carefully and double check your PAN CARD name, Bank account no., Debit card or credit card information. Any error ? Please fix it. 5. Now 100% accurate. Excellent! you are on the way now click the Agree and Create Account button and you are done. But the verification process starts now. You have to wait now, they will send a small amount ranging between 1 to 2 INR. Just check your bank account and note the small receiving exactly. Didn’t receive ? Don’t worry sometimes it takes about 15 days depending upon your location. 6. 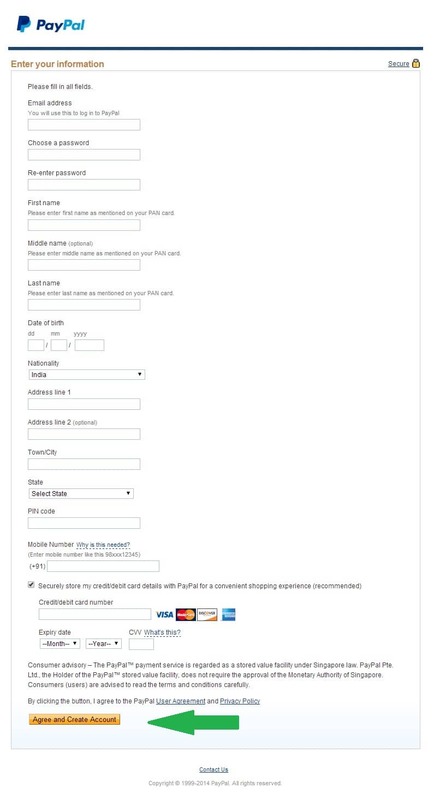 Last but not least, go to PayPal.com and log in to your account or refer to the link sent in your associated e-mail during creation of your PayPal account. Now verify your account after placing the two noted small receiving from Paypal. Congratulations! You have been able to create free PayPal account successfully. And your PayPal account is ready now. Start shopping, earning and receiving payments from overseas. Happy PayPal-ing…..! Hope this post would have helped you to create free PayPal account. If you found any problem while creating your free PayPal account then do let me know via comment section below. Sharing is Caring ! So share this with your friends and help them to create free PayPal account.